Credit card debt can be as slippery as an eel. One minute you think you have it under control. Then the next minute it’s slipped away and you’re looking at credit card balances that could make Warrant Buffet faint away. 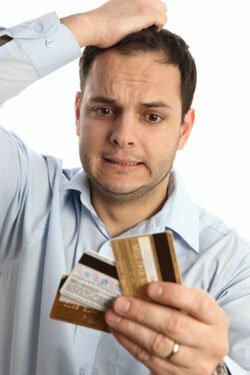 Even if you’re doing a great job of managing your credit card debts, there are people out there who are trying to make it worse. The FTC (Federal Trade Commission) recently revealed a new form of theft called cramming. The way this works is that small charges are secretly added to your credit card statement. These are typically for $10, $20 or $30. These are hidden so well in your credit card bill you might never see them. But they add up over time so that by the end of a year, you might have paid $240 more than you really owed. These charges usually come in the form of fake fees. They typically have names like Debt 2 Wealth and their goal is to just steal a little at a time, trusting that you won’t notice. Have you applied for a payday loan? Cramming often happens to people who recently had a cash advance or payday loan. In the event they noticed the phony charge and called the toll-free number adjacent to it to file a complaint, they usually ended up in a confusing jumble of call centers all around the world and were never able to get any satisfaction. The FTC estimates that 20 million Americans a year are being crammed with these phony “fees”. This adds up to around $24 million that the thieves are harvesting annually. And it hits us right where it hurts – in the wallet. Make sure you review all your credit card statements and phone bills carefully. It appears that many of these false charges were hidden in phone bills. If it does look as if you’d been crammed, contact your credit card provider or phone company immediately. You can dispute the charge and it will be temporarily debited. Your credit card or phone company will attempt to validate the charge. If it can’t – because it was fraudulent – it will be permanently debited so you won’t have be required to pay it. Another reason why you should carefully review all your statements, especially credit card statements, is because you identity could have been stolen. Identify theft is the biggest and fastest-growing crime in America. I have seen reports that hundreds of thousands of Americans have been victimized by identity theft. There’s no way to totally prevent this from happening to you. But you need to be on guard at all times, which means you should monitor your bank accounts and review your credit card statements and credit reports on a regular basis. In fact, the experts say you should have online banking and check your accounts daily. If you were to spot something fishy, you could take quick action, contact your bank or credit card provider and provide notification that your identity may have been stolen. The good news is that if your identity is stolen, it likely won’t cost you anything. Your bank or credit card company will make up your loss. Be sure to keep this in mind before you sign up for one of those costly identity protection service. Most can’t do as much to help you as your own financial institution. If you debt has gotten away from you and you’re now staring at a massive pile of unpaid bills, we can help. Our debt counselors are experienced pros that could contact your lenders and negotiate settlements that would save you thousands of dollars on your unsecured debts. Call us today and let us explain the many benefits of debt settlement.